Huawei E353 USB Modem Not Detected on Ubuntu - This time I'll share how to setup this USB modem. I'm facing this problem when I'm using Backbox linux. This guide also can solve for Ubuntu, cause Backbox is based Ubuntu 14.04. For so long time I've Ubuntu (14.04, 15.04), it's always detected my Huawei E353 USB Modem automatically. So I write this simple trick for you who have same condition. That's the screenshot of solved Huawei E353 doesn't detected automatically. I plug it in, and after a seconds the status light turns green and blinks twice every 3 seconds, which according to the manual means that the stick is activated and waiting to connect to a network. At the same time, it doesn't show at network manager. We will use usb_modeswitch to get this USB dongle modem work propery. 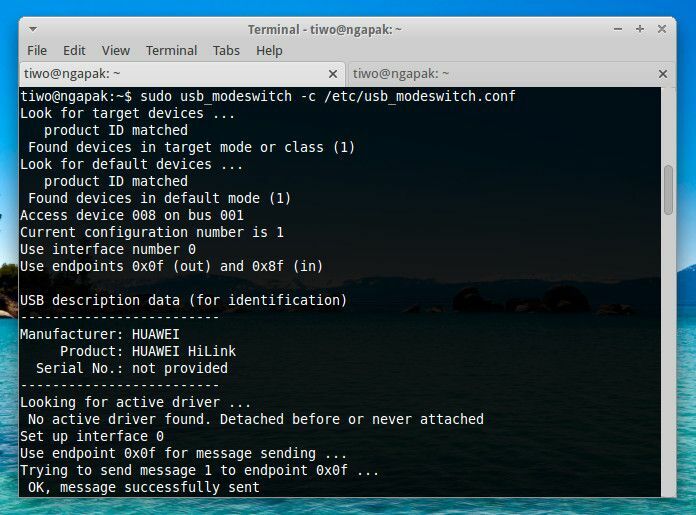 So make sure you have usb_modeswitch installed on your ubuntu. Let's start! Bus 001 Device 005: ID 0cf3:3004 Atheros Communications, Inc.
See Network Manager at Linux panel, and viola you did it! Your Linux detected Huawei E353 USB Dongle Modem now work prefectly. Open your browser, open 192.168.1.1 then connect it form main page. So that's all I can write about How To Install and Configure Huawei E353 USB Modem on Ubuntu and fix modem not detected. Hope you've enjoyed reading this tutorial as much I’ve enjoyed writing it. Let us know about more useful mozilla firefox extension by comment below this post. Thanks for visiting us.